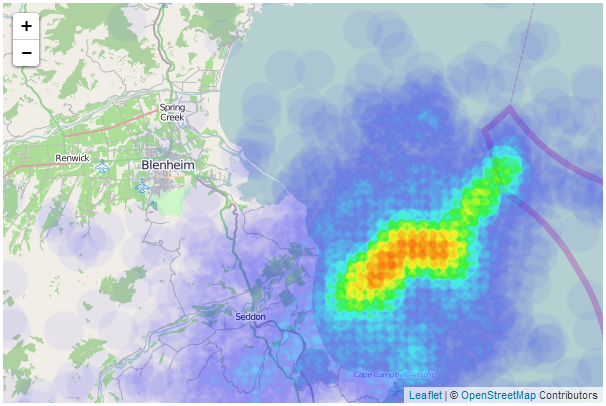 A heatmap is a two dimensional representation of values encodes as colours. 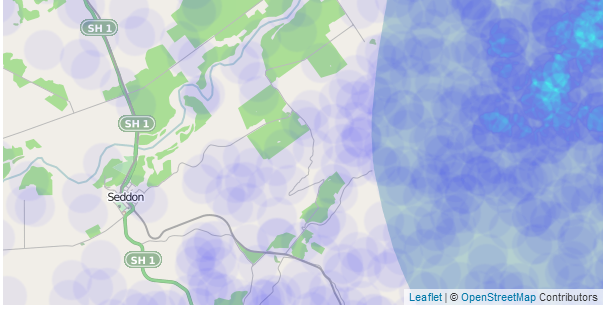 In our case these colours are superimposed over a map generated using leaflet.js. The example here represents seismic activity in July / August of 2013 in central New Zealand, when they were unfortunate enough to experience a series of earthquakes. In areas of greater intensity and density, the heatmap produces a gradient that varies from blue to red. This example shows a definite region of increased activity over the time in question. The following is a code listing that we will use to describe the required changes from our simple-map.html example to enable Leaflet.heat. There is also an online version on bl.ocks.org, GitHub and can be downloaded along with the data file (in a zip file) when you download the book from Leanpub. There are only two ‘blocks’ that have changed in the code from our simple map example. 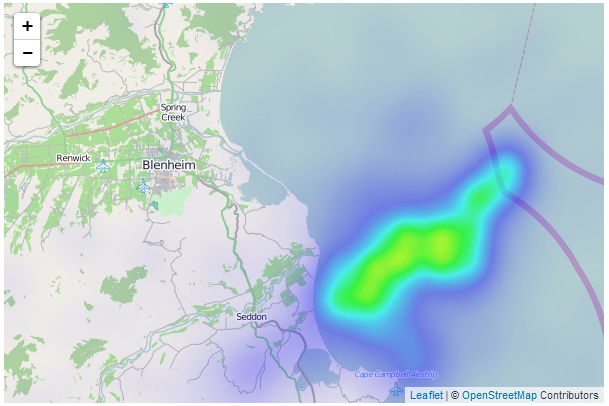 The first link loads the Leaflet.heat plugin and the second loads our data from 2013-earthquake.js. In this block we load the data as the variable quakePoints then set our radius, blur and maxZoom values for the plugin. The radius option sets the radius (duh) of the circles that correspond to a single data point on the map. If we remove the blur effect we can clearly see the effect on the map. As we zoom in and out of the map, the radii of the points remains constant on the screen, but the representation that they create on the screen changes as there are subsequently more or less points to generate an effect. Obviously this is something that you will want to consider as you plan how to set the configuration options on your maps :-). 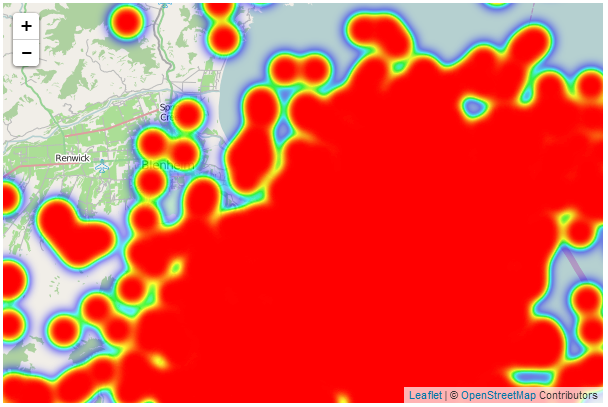 Wow, Heat map is so spectacular. It makes any "boring data" look like a Piet Mondrian art piece ! Is there any method to clear existing data inside of a map? For instance, I would simply like to show and clear the data every time I click a button. Hi, any idea how to update the L.heatLayer (e.g. i want to add a slider for radius size)...? Many thanks for a great page! Sorry for the late reply. I've never experimented with that myself, but I recommend that you try a couple of things that might get you closer and if you're still struggling use these experiments to ask a question on Stack Overflow. Best of luck. thank you for the reference. 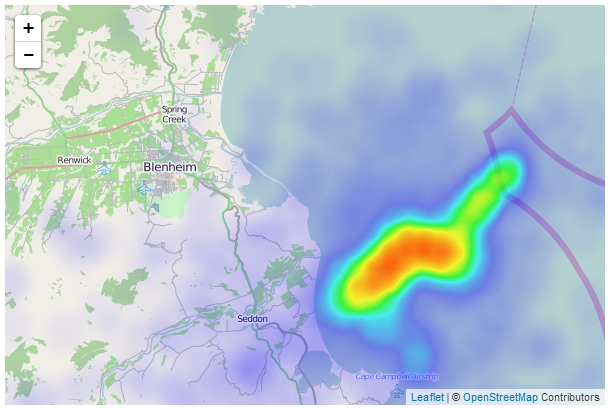 Still looking for a detailed example where they read data from file(say ".csv") and visualize a heat map. Couldnt fine one though. Hmm... could you possible consider that the hexagons (if small enough) could form the heatmap?